It appears that mobile devices like iPads in the classroom are revolutionizing the way education is being taught on school wireless networks. The use of these mobile devices for teaching and learning is increasing at a rapid pace. Students and teachers are finding that with these appliances, the classroom is becoming a more challenging but enjoyable atmosphere. While this trend continues to grow, app developers are hard at work creating exciting new ways for students to learn and teachers to educate. The iPad for example, has several engaging and informative apps for those wanting to incorporate tablet usage in their lesson plans. Here are 4 of my favorite educational apps for iPads in the classroom. MathBoard is an application designed to help anyone looking to exceed his or her skill in arithmetic operations. The difficulty of problems is customizable, making a great learning tool for children, or adults wanting to improve their basic math skills. Its ease of use allows you to select the topics for quizzing. The topics included are addition, subtraction, multiplication, division, squares, cubes and square roots. While taking the quiz, you can work the problem in a designated area at the bottom of the screen with your finger or stylus. Once you have completed the quiz, you have the option to save your work. You can later come back and retake the quiz, or simply rework the problems you got wrong, making a dynamic learning experience. This wonderful learning application is one of my favorites due to its diversity and quality of content. Whether you’re seeking differential equations, or art history of humanities, khan academy has lessons to offer. Students can make use of the comprehensive video library, interactive challenges and assessments. The interface is customizable allowing a complete self-paced learning tool. Teachers also have the ability to overlook a student’s performance, as well as real time class reports. This non-profit organization also offers its all-encompassing lessons free of charge! For schools wanting to implement mobile devices in classrooms and need applications to go along with it, this is surely a contestant. The importance of organization is one aspect all teachers can most likely agree on. 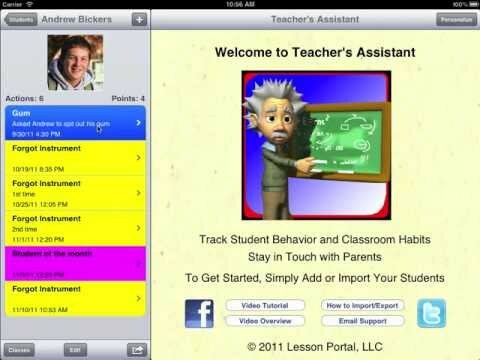 Teachers Assistant Pro was designed by a teacher for teachers to document student behaviors, infractions and achievements quickly and easily. With this nifty app, teachers can document reports in real time and send them instantly to parents and administrators by email. Also, organizing important documents is a simple and clean job. Lastly, the app can be customized for the teacher’s classroom needs, which is certainly a plus. For any teacher experiencing stress in the classroom, Teachers Assistant Pro is sure to be a worthwhile app. 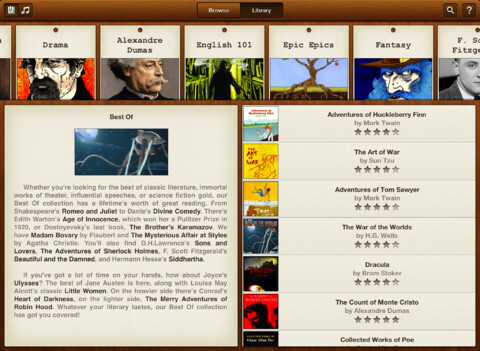 With 23,469 classic books at your fingertips, Free Books is a must have for any teacher. Not only does it provide access to classic novels, but letters, autobiographies, speeches, and other writings by illustrious historical figures and identified geniuses. This app also has some cool features, such as adjustments for text size, landscape mode, stored favorites, highlights, and auto scroll. Free Books is a great app full of useful information and not to mention it’s free! These are just a few of the thousands of fantastic apps available for use on iPads in education. iPad technology in the classroom can offer a plethora of benefits to both students and educators. If your school has not already implemented a 1:1 initiative or BYOD on your school wireless network to bring these invaluable learning tools to your students and educators, now is the time. We are experts in designing school wireless networks for secure iPad and other mobile device implementation. Feel free to contact us here with any questions or a free consultation.